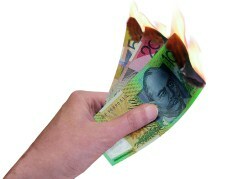 Stop burning that money! It's bad for the climate! The carbon tax will do nothing for the climate. Terry McCrann points out the blindingly obvious (to everyone except Julia Gillard and the Labor/Green government), namely that China’s increasing emissions will dwarf any reduction in Australia’s already tiny carbon footprint. Australia’s planned reduction of 5%, of the 1.5% of global emissions it produces, equates to less than eight hundredths of one percent of global emissions. Even if we assume global emissions remain constant, such a tiny change will make no difference to the climate. But of course, as the alarmists like to say, it’s worse than we thought! Since global emissions will continue to increase as China chews through more and more coal every year to support its rapidly growing economy, Australia’s token reduction will be swamped many times over. So we know that the carbon tax will do nothing for the climate. So what is it for? It’s a very expensive, very damaging political gesture to keep the Gillard minority government in power by buying the support of the Greens (I wouldn’t pay 10c for a Green, let alone $10bn), and to kowtow to the pointless political correctness that pervades the climate agenda, run as it is by the UN and mega-environmental groups like WWF and Greenpeace. It will do nothing for the climate but it will line more than a few pockets. Simon, Yes some of us do not understand! The ignorance and apathy of fellow Australians to allow the lie to be perpetuated is stunningly amazing! I am certain if Spokesman Flannery was to pronounce that carbon required the cessation of beer manufacturing and consumption then Australians would riot on the streets. There again, with all the the past oral diarrhea pronouncements by Flannery that public apathy may still prevail. RA, I think you have made a very good point about the general Ozzie punter’s political apathy but the blindingly obvious to all but a few (of us like-mind souls) know that the Lie-Bore types know that the carbon (dioxide) tax has nothing to do with ‘saving the planet’, rather it’s just a wealth redistribution process for sustaining the power of those that perpetuate these deceitful lies. Again, they dodge the issue of nil effect by regurgitating a mantra akin to: “we’re doing the right thing” (perhaps in the hope that others will follow). take from me … give to him. Is there a list available to view of who the top 400 (I thought it was 100) companies are who will be taxed and how is this list buit? But, the Carbon Tax was *NEVER* intended to have any effect on the climate, so “Mission Accomplished” . . . . . and it only cost $10,000,000,000 . . . . so far . . .
it will be worse for the climate, someone has to cut down more trees to print more money to pay more tax…….Nice…..
@Jezza King initially there was talk of a list of the top 500 “polluters”, no-one has ever seen it. but then there was a list of the top 250 “polluters” published. in the list were many non-alp councils…and last but not least, snowy hydro ltd. so hydro in tassie is clean, but hydro in vic is “polluting”??? When I talk with fellow Australians, people such as my hairdresser and her clients waiting like me for a haircut, they are actually not ignorant and apathetic nor do they intend the lie to be perpetuated about CO2 being a pollutant that changes the climate. They are more candid about this “nonsense” than decency allows me to write here. They just know that whenever the Prime Minister, whoever that happens to be at the time, calls an election then they will have their say. Until then they are just biding their time knowing that they will wreak their revenge in the privacy of the polling booth. Meanwhile the spread in the Two- Party Preferred polling between the Coalition and Labor has never been bigger than right now (61.5 versus 38.5). A Lower House massacre is on its way. My biggest concern is that, so far, the alternative government has been too gutless to declare their known facts about corruption of climate science; their Direct Action policy is also based on the same CO2 lie. So what will the voters do? They can’t vote for the Libs. They will definitely not vote Green. This is looking good for the Nationals and those minor parties who have had the guts to declare the truth. The make-up of the Senate after this next Federal Election will be fascinating to behold. Don’t forget the additional $599 million that Australia has pledged to “support developing countries to adapt to climate change” (2010-2012) . More Australian taxpayers money being sent overseas to sponsor the ‘green demon”! @Jezza King have you seen the price of international “carbon” credits lately? This is exactly the economic nightmare for taxpayers that I have been dreading. The Gillard green government is not going to make any difference to climate but somehow it finds it economically sensible to waste $10 billion. Is it any wonder the left always suffer from economic mismanagement? BUT – everybody seems to have really missed the REAL insanity !!! This government has plans to double the coal industry over the coming decades, most will be exported – TAX FREE – while we choke on energy bills that will kill all industry here. The net effect will be a doubling of emissions from Australian coal – burnt overseas tax free while our society descends into the financial morass currently encompassing Europe – where, for some reason, the fact that chasing expensive renewable energy is sending countries bankrupt is some how not mentioned. Spain is broke because of investment in renewables – the government withdrew subsidies and the banks are left with worthless loans to bankrupt companies and there will be no buyers – economic crisis !! Even Germany is facing problems. And the big problem with the current financial mess is this time it is government debt that is the problem- the US because ultimately 2 gov’t organisations ended up with the subprime mess – Fannie May and Freddie Mac. In Europe several government’s Bonds – once the “gold” standard in security – are now junk bonds. And a significant proportion can be sheeted home to climate “science” and fighting climate change – what a joke because they haven’t even reduced emissions – and we’ll soon follow them !